Hangs midway on the stairs to the second floor. 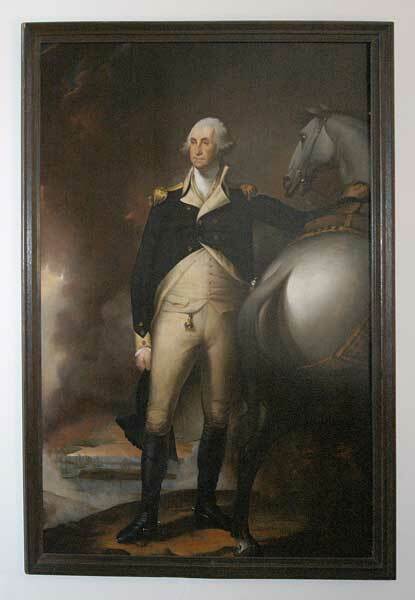 This copy of Gilbert Stuart’s “George Washington at Dorcester Heights” (which hangs at the Boston Museum of Fine Arts) is believed to have been painted by William Edward West. The painting has been with Willard Library since its opening, but how it came to the Library was a mystery until 1954. At that time, Julia Evans Stephens Shea, a resident of Hollywood, California, and descendent of General Robert M. Evans, was visiting Evansville. During her stay, she read a newspaper article by Bish Thompson on the cleanup and minor restoration of the painting. Shea was the only living heir to the painting in 1954, and she determined it should be left on display at Willard Library. It hangs there today. Willard Library Director Greg Hager told me an interesting story about this painting that maybe I will be able to get him to share on this blog! My middle son, JJ, who just turned 37 lives in Cincinnati and asked me about this painting that he remembers as an 8 or 9 year old. J. Paul Wurtz is the photographer of these Willard Library images, taken in 1948. The reading table and bench from Columbia school were a gift from Mrs. Sam Warren. The depictions of Willard Library and other notable buildings of Evansville are from Frank Leslie’s Illustrated Newspaper, October 12, 1889.